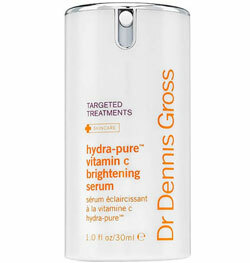 As a big fan of Dr Dennis Gross’ products, I was tickled pink to have the chance to review Dr. Dennis Gross Hydra-pure Vitamin C Brightening Serum ($95). 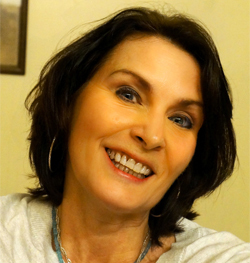 I just turned 57 last month, and have learned to live with a few wrinkles around my eyes and forehead, but cannot tolerate the extra pigmentation that even foundation doesn’t completely cover. Over the past few years, my combination/normal skin has been plagued with brown sun spots from years in the sun, as well as some capillary redness, so I was looking for something to reduce redness and brown sun spots. DDG Hydra-pure Vitamin C Brightening Serum arrived in a state-of-the-art pump container which prevents product degradation from air and light. It has a plethora of ingredients, many of them natural, though not all of them may be acceptable to the purists reading this. DDG’s website literature points to the key ingredients as 3 potent forms of Vitamin C at 18% total, and linoleic acid which is not only essential for rebuilding cells, but also helps deliver the vitamin C to the skin without causing irritation. Other power ingredients of particular note are black tea ferment, sodium hyaluronate, soy isoflavones, lactic acid, and tetrapeptide-21. On the DDG website, this product is also touted to contain a proprietary formula called Hydra-Pure Chelating Complex, which is said to help prevent redness, irritation and signs of aging by removing the heavy metals in the water and your environment. This serum is lightweight, silky in feel, and has a silicone base. Initially, I had a little trouble spreading the 2 pumps of product on my freshly cleansed skin. This may be due to the fact that my skin is becoming drier as I age. However, that problem was easily remedied by adding a tiny bit of moisturizer to the serum so that it spreads more easily across my face and neck. I also found that allowing the serum to warm up a little in my palm helped it to spread easier. Since it contains silicone, I was concerned about pilling, though it did not pill unless I used too much. For me, 2 pumps was about the right amount to prevent pilling and cover my face and neck area. Since I am a fan of DDG Original Alpha Beta Peels as well as DDG Triple C Peptide Firming Oil, I wanted to see if this Hydra-pure Vitamin C Brightening Serum faded my brown spots as effectively as did rotating those other 2 DDG products. I first used the Hydra-pure Vitamin C serum with my Sweetsation Q’Lumiere Organic Day Cream for the first 2 weeks. I did see some brightening of my naturally sallow skin tone, but only a barely perceptible fading of my brown spots. Of note, my pores also seemed smaller after using this serum, though I did not notice any additional firming response. Using only the Hydra-pure Vitamin C serum, I soon discovered it did not perform as well as either the Alpha Beta Peels or the Triple C Peptide Firming Oil by themselves. Over the past week, I have rotated it with both the Alpha Beta peels and the Triple C Peptide Firming Oil. Using it in conjunction with one or the other of the aforementioned DDG products did increase the brightening of my skin to the point I am once again able to run errands without applying any foundation other than a tiny bit of under eye concealer. Honestly, I liked this serum mainly because it helped brighten my skin tone when used in conjunction with one or other of the DDG products. However, it was just not enough on its own for me. I also noticed that in spite of the formulation, it did seem to dry my skin out, and my broken capillaries seemed unimpressed. Since it was recommended to use this at night, I did and found that upon awakening, my skin was not as supple as normal. It actually looked a little rough. Even applying extra moisturizer at night did not prevent the drying effect this serum had on me. However, I do have to say that using it in conjunction with either the DDG Alpha Beta peels or the DDG Triple C Peptide Firming Oil did take my skin to a new level of brightness without any sallowness, and did fade the brown spots further. This would undoubtedly be an excellent vitamin C serum for those who want to help prevent sun spots or even out their skin tone, though it was not quite enough for me on its own. Taking the price and lack of superior results into consideration, I would probably not benefit from continuing this serum. It retails at $95 for 1 ounce of product. I have been using it approximately 3 weeks, and still have product remaining, though I am unsure how much. While I do appreciate the fact that this DDG Vitamin C serum is well protected from degradation by light and air by its packaging, I just don’t like not knowing when I am going to run out. There seems to be no way to tell how much is left at any given time. Overall, I would rate this as an effective vitamin C preventative measure for those who haven’t developed years of sun damage. But again, it did not perform well enough for my more mature skin pigmentation concerns, and did seem a little drying. Despite my issues with it, I would still rate it a 3.5 to 4 star product.